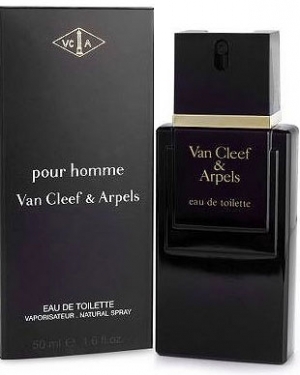 Van Cleef & Arpels - Van Cleef & Arpels pour Homme (M) ? Illatcsalád: Fás- aromás ? Megjelenés éve: 1978 ? Illatösszetétel: Bergamot, Levendula, Borókabogyó, Zöld jegyek, Jázmin, Rózsa, Pacsuli, Köménymag, Majoranna, Szegfű, Vetiver, Cédrus, Májvarózsa, Bőr, Kókusz, Ámbra, Pézsma ? Töménység: Eau de Toilette Spray (EdT) ? Leírás: This classical leather scent for men appeared at the time when ultimate intensive chypre and masculine leather fragrances were very popular. It became a synonym for classical men's elegance in the world of fragrances. The fresh aromatic opening includes the notes of basil, bergamot, green notes, juniper berries, marjoram, thyme and lavender. The heart is warm and even hot, featured with woody notes of Guaiac, patchouli and vetiver, tender floral and sensual spices. Dark and mysterious, masculine base notes are composed of amber, castoreum, smoky incense, dark leather, oak moss and musk. The perfume was created by Louis Monnet in 1978.